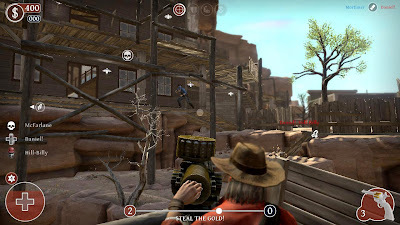 Synopsis: While waiting for an unnamed western soon to be released, we received a review code for the PSN and PC online third person shooter, Lead and Gold: Gangs of the Wild West. This title places players in the Wild West to relive the myths we all grew up on when playing with our toys guns and watching spaghetti westerns with our parents. Focusing on team based action, some of the available gameplay modes include conquest, which has your team trying to take over specific areas in order, greed, which has the players trying to carry as much gold sacks to a drop off zone in a set time limit, and my favorite, powder keg, which has each team trying to blow up a set objective by moving an explosive powder keg to a set destination, but you can easily take out your opponent if they are carrying the keg and you happen to shoot it. If you’re a team shooter fan, the below is for you. 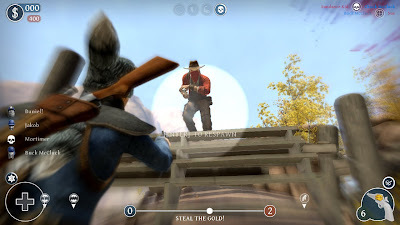 Praise: For a downloadable title that is strictly online multiplayer with exception to the practice play, there is a lot to like about Lead and Gold, starting with the simplicity. The developer does a good job at making this feel like a western, from the great maps that look like how I would picture the west and classes that use the character classes we have grown to love in other titles in the genre while still feeling like they fit in with this game. 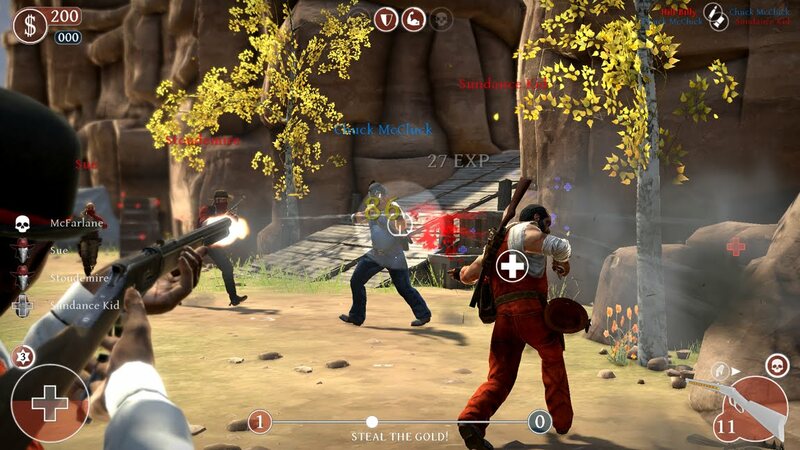 A class specific synergy system is a feature new to me from other team multiplayer games I have played and works well, as synergy is a unique ability that is effective only when teammates play cooperatively and tactically. 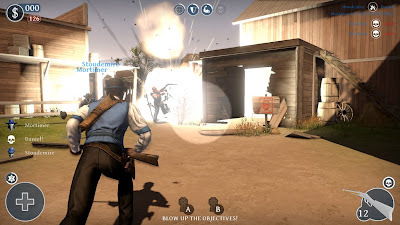 There are four available character classes which consist of short range, mid range, long range and explosive weapons, the deputy being my favorite as he uses a mid range weapon, pistol as secondary, and can tag an enemy so that even if they run out of your line of site, you will still be able to locate them. I have always been able to locate matches without experiencing lag, not even once so far, and once I would start playing a good two or three hours would go by before even thinking about turning it off. Gripes: This is a multiplayer game, so if you are looking for a single player story to play along with the multiplayer matches or to just get used to the gameplay of Lead and Gold, good luck as it is strictly multiplayer with a small practice mode. As well as the lack of single player, it seems the developer also left out a tutorial, sure you can pull up options for instructions and controls, but in regards to experience points and character development, there is not much to help the player get their bearings as to what to expect while playing through the multiple game modes outside of what is seen in the load screens. While I have not had a problem with finding matches or lag, I have yet to play a match where all of the player slots are full. I think the most I have seen in a match was six people and the maps are pretty large, making it difficult to locate the one or two opponents you are playing against. There is also no cover system which I have not had an issue with in previous games, but it would definitely be a welcome feature in this game as you are unable to duck before popping up and releasing a bullet storm on an unsuspecting passerby. Overall, Lead and Gold is a fun game and for the price and the replay value, it is well worth the fifteen dollar price tag. While there are a few things that take away from the fun to be had, there is just enough, if not more content to help you get past any issues you have with the mechanics. One thing I am worried about with this game releasing so close to Red Dead Redemption, it is hard to tell exactly how many people will still be playing this after it hits store shelves. I am hoping that since this is not a sixty dollar title, there will still be a large number of Lead and Gold owners standing behind this title. Mashbuttons.com gives Lead and Gold: Gangs of the Wild West a 8 out of 10. Lead and Gold: Gangs of the Wild West is available now on PC and the PlayStation 3.